Just before Christmas various members of the church took up the invitation to attend the National Gallery. Esther made the arrangements, some of us met at the church and some of us went straight to the National Gallery. Outside the Gallery there were many people showing their talents, artists, magicians, people being statues, etc., and a very odd statue of a hand with one finger pointing upwards. 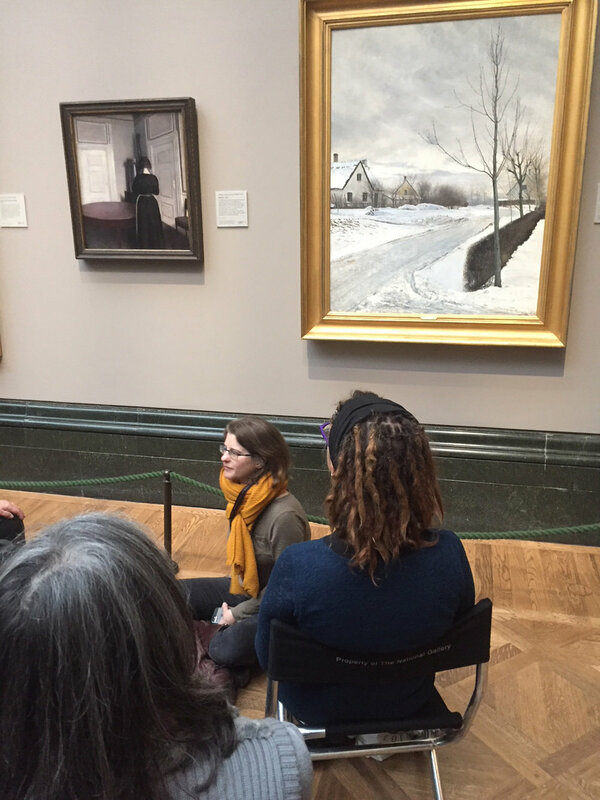 Once we all got inside we were met by Caroline Campbell (who attends the 8am service at St Anselm’s and is a senior curator at the National Gallery) and were taken to a room where she explained what we were going to see, 4 paintings. We could leave our stuff in the room, so without baggage and but with a chair we went to look at the first painting. Caroline asked our view on the first painting. It as a picture of a man on his knees holding a rock, with various animals in the picture, members of the group said what they saw, an owl, a goat, two people in the background. I thought the painting was of Peter being the rock, but it was a picture of St Jerome, this was only part of a larger painting the other half was in a gallery in Italy. St Jerome was a 4th-century religious scholar and ascetic who's responsible for the Vulgate, the Catholic Church's Latin version of the Bible's Old Testament. 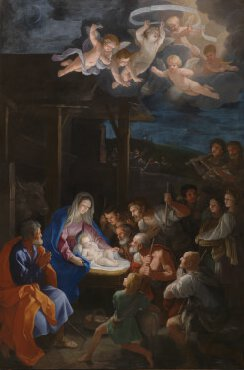 We then moved on to the second painting – a picture of Jesus’s in the manger glowing with all sorts of people in the picture, young children, old people, shepherds, musicians, the 3 wise men, Mary and Joseph, baby angels all glowing with the glory of Jesus. I really liked this painting as everyone was happy, it was as if they all knew who Jesus was and why he was born. The third and fourth paintings we viewed were side by side, which was the Winter Day and Interior, cold paintings, the first a cold winter day, the second a woman standing with her back to the artist the room having no colour, everything seems dark but there is hope, a new beginning, a taking of stock, a time for peace and acknowledgement that through all circumstances God is in it. He has to be the centre of our being in order for us to survive. The afternoon was most enjoyable, the National Gallery is free to visit, so I hope that I have encouraged someone to visit, would I go again, yes – it is beautiful to see God in all things.